In our last post we talked about developing buyer personas, and offered a template to help guide you through that process. If you’ve taken a look at our examples—Gary the mortgage broker, and Maria the loan processor—you’ve begun to understand the kind of very useful information that you can gain from the buyer persona. Now your question is probably: how do I actually use this narrative persona to help me segment my database, so that I can run campaigns targeted closely to those segments? First, stop thinking about segments and start thinking about individuals: Maria. If we want to run a campaign to Maria, what fields in the database and what values in the database would make up Maria’s persona? Take another look at our example of Maria’s buyer persona. In the sidebar, we’ve identified some of the database fields and their values that we’ll use to create our “Maria.” In your case, you’ve got to identify what fields and what values are appropriate for your personas, then create those personas within your database. To “operationalize” your personas, you need to have structured records with the appropriate fields in both your marketing automation (MA) and CRM systems. 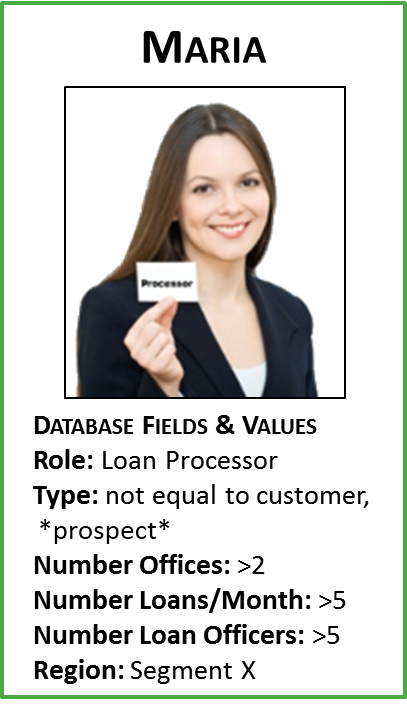 For example, you will no doubt want a segment in your database that is targeted to prospects or non-customers, so you probably need or already have a field called type. 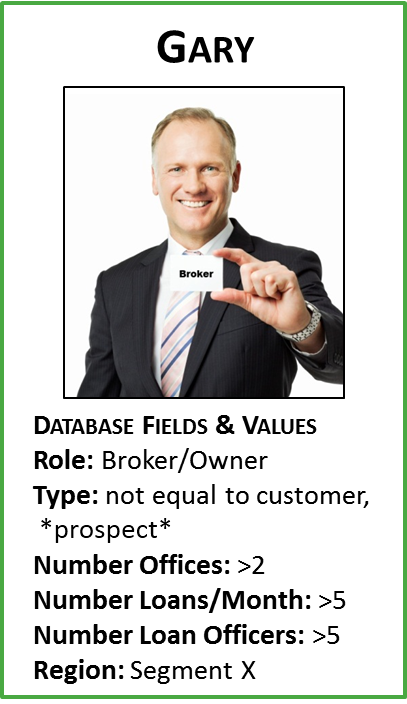 The possible values for the field type might be customer, prospect, partner, vendor, competitor, employee, and so on. Depending on your industry and type of business, you might have more specific values for type. This illustration shows the database fields that we have decided to associate with Maria. Maria is an ideal buyer for our mortgage product, and because we took the time to develop the buyer persona for Maria, we have gotten to know her pretty well! So it is fairly easy to establish the values that our Maria will have in these six key fields. It’s all about her fitness for our product. Maria is a loan processor, so that is her role in the business. We need to know this so that our messages to her are appropriate for her role. When we target Maria as a prospect, we use this field to exclude customers from the campaign. 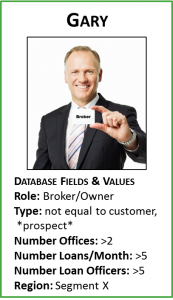 Our ideal customer is a mortgage business which has at least two offices. Anything smaller is not a good fit for our product. Therefore, Maria’s business has more than two offices. Perhaps for another purpose you would create “Maggie,” another persona representing a loan processor who is a “one-man shop.” But Maria is the persona of a loan processor who works within the right size company. If your Number of Offices field has multiple ranges for offices, you’ll likely use filters in your marketing automation system to include all the appropriate ranges. If a mortgage business is doing fewer than five loans a month, it’s not a good prospect for our product. 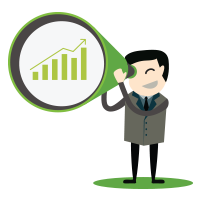 Therefore, Maria’s business does more than five loans per month. The same thinking applies here as applies to the Number of Offices field above. If the business has fewer than five loan officers, it’s too small for our product. 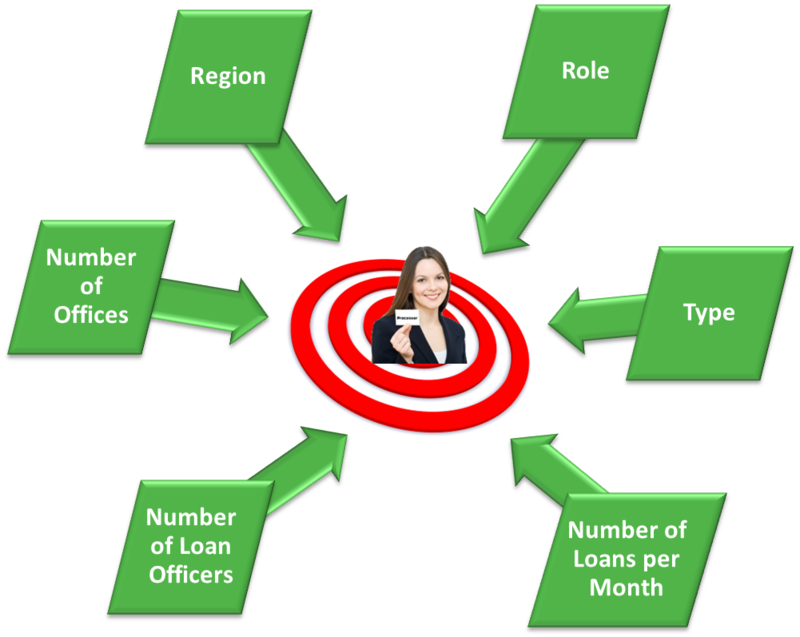 Therefore, Maria’s business has more than five loan officers. For segmentation, the Number of Offices field is used and would include all ranges above 5. In the mortgage industry, regulatory issues differ greatly across the country. Therefore we have established certain regions that are the best fit for our product, and Segment X is one of them. So Maria’s business is located in Segment X. If your marketing needs require it, you might also have “Martha,” who could be Maria’s peer persona in Region Y, “Magda” in Region Z, and so on. It’s critical that your marketing automation system and your CRM are in parity with regard to fields and field values. Fields and field ranges in your CRM should directly line up with the fields in your MA system. That way if a salesperson is capturing or changing that information, the MA system and CRM remain in sync with one another. Take another look at our two persona examples. You’ll see that the one for Gary the mortgage broker/owner includes the same field set: the only core difference is the role. 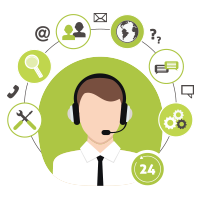 Because we are distinguishing between the two personas at this detailed level, we can truly tailor messaging to the right persona. Both of these personas represent our ideal customer profile: they work at the same type of office/business, but their roles are different. Let’s imagine we want to run a campaign for an inquiry nurture. Without personas defined, anyone who goes through this nurture campaign would get the same messaging. But now that we’ve designed our personas, we can run campaigns with messaging that speaks one-to-one with the prospect. The way to build these segments is through contact filters. Nice information, Thanks for sharing. Can create segment by personas e.g. Department, Locations.